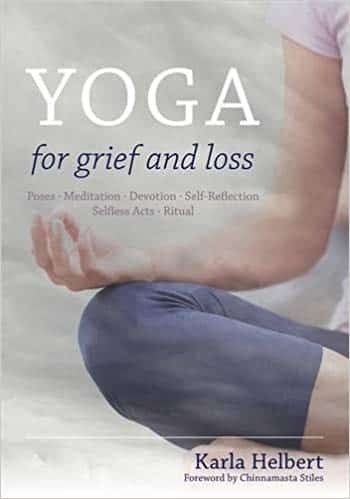 Yoga for Grief & Loss author Karla Helbert, LPC, shares how the yogic practice of non-violence, called "ahimsa," can help us be our own best friend during the difficult days, months, and years after a major loss. Drawing from her own experience as a bereaved mother, a yoga therapist, and specialist in traumatic grief, Karla shares how she applies the principle of "ahimsa" to her own waves of grief over a decade after her loss, and how you can start your own practice in just minutes a day. Learn more about Karla at http://karlahelbert.com. Grief is such a personal experience. And yet, some aspects of it are quite universal. One of the most common behaviors that I have witnessed—both in myself and in my clients—is self-criticism and negative self-talk. This is true for many of us even when we aren't grieving! What would happen if we could be kinder to ourselves in the face of loss? If we could be our own best friend? At least then we would have one person we could count on—our self. My friend and colleague Karla Helbert shares this viewpoint. As the author of Yoga for Grief & Loss, Licensed Professional Counselor in Virginia, yoga teacher, and yoga therapist, Karla sees this in her clients, too. As a bereaved mother, she sees it in herself. Fortunately for us, Karla generously shares a simple technique for quieting the inner grief critic in this episode of the Mindfulness & Grief Podcast. Karla shares the yogic principle of "ahimsa," which means non-violence or non-harming, and how we can go beyond applying it to the people in the world around us, but to ourselves. Of course one of the keys to making this work is that we don't treat ourselves bad for treating ourselves bad, but this is easier said than done. It takes practice. And self-compassion. What I love about this episode is that Karla is willing to share personal examples of how grief can derail her, even over a decade beyond her loss. Grief doesn't go away, the waves just have more space between them. Learning how to practice this now will serve you for years to come, and help you be nicer to yourself in all areas of your life, not just when you experience grief.